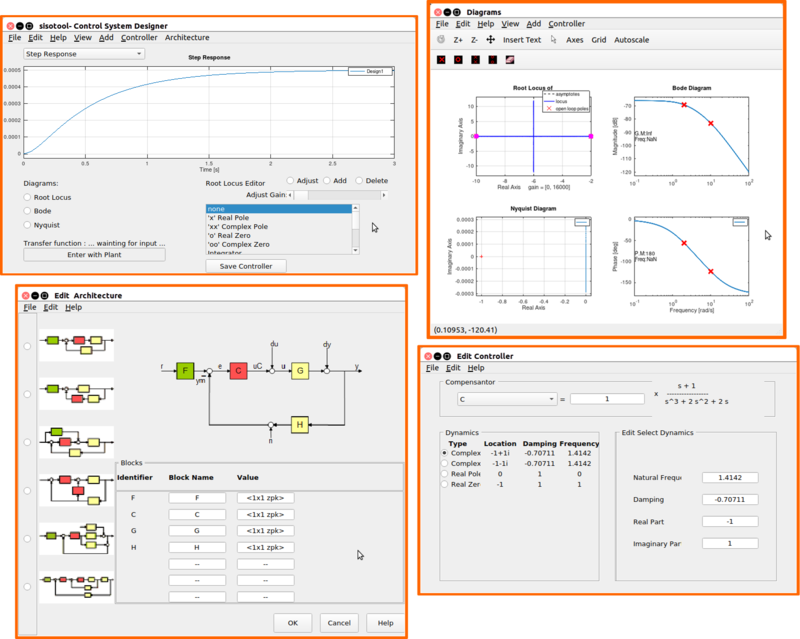 The Interactive Tool for Single Input Single Output (SISO) Linear Control System Design let you design SISO controllers for feedback system modeled in GNU Octave. 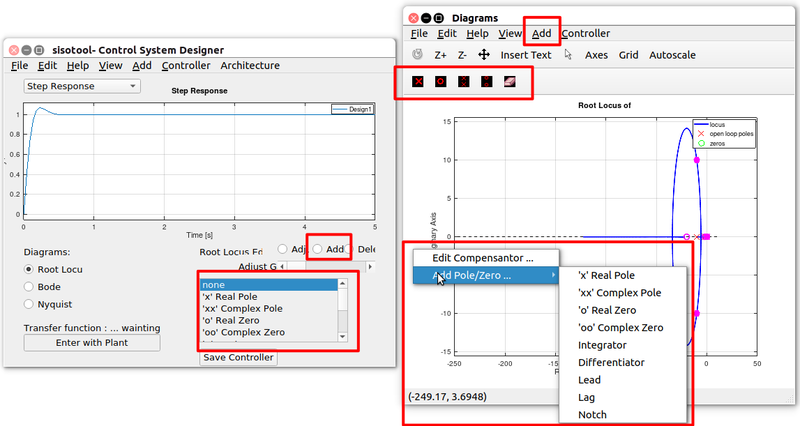 Root Locus graphical editos for adding, modifyng, and removing controller poles, zeros and gains. 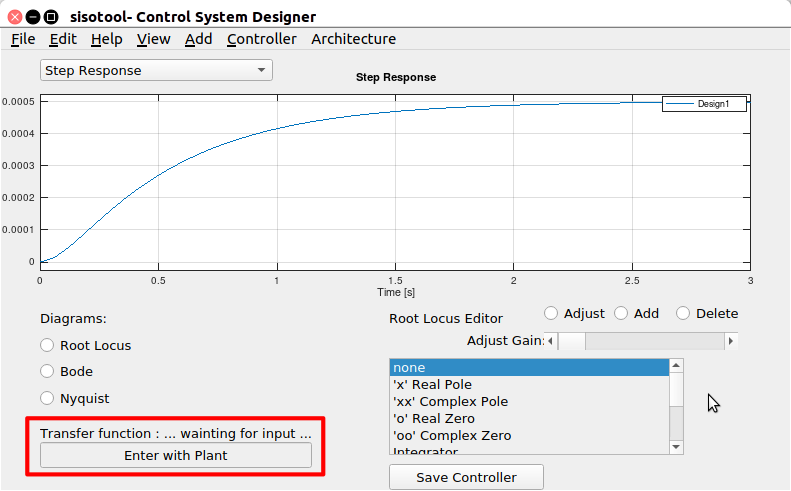 Analyze control system designs using time-domain by step responses. Save the controller to workspace. Arbitrary list of response plots. Tune compensators for different loop control structures. sisotool (G) specifies the plant model G to be used in the SISO Tool. Here G is any linear model created with TF, ZPK, or SS. sisotool (G, C, H, F) further specify values for the feedback compensator C, sensor H, and prefilter F. By default, C, H, and F are all unit gains. 'rlocus' : Root locus plot. 'bode' : Bode diagram of the open-loop response. 'nichols' : Nichols plot of the open-loop response. Additionally, the user can also add the plant at following edit box. Or by using the icons in the top of Root Locus Diagram. Then, the user can add the feature to the desired position; adjust the position or delete the feature. Additionally, the user can open the Edit Controller Tool by clicking in the top of the page. In order to compare the performance of two or more different control system designs, we need to salve all the desired compensators using the button Save. 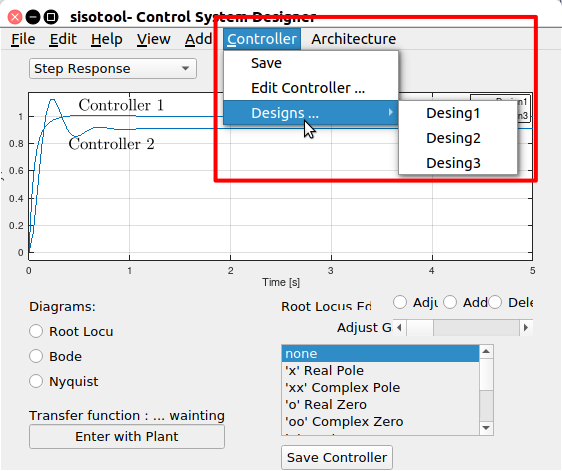 All the controllers will be saved and can be showed in the tab "Controller/Desing.../..."
In sisotool you can also specify multiple models for any plant or sensor using an array of LTI models (see Model Arrays). This tool can be execute in the following way. The front-end of this functionality is working; however, it still need a bit work in order to upload the LTI system. If you have a question about installation or sisotool in general, feel free to contact myself. In addition, Octave mailing list is an excellent source of community support. Theme created by Jim Crist. Licensed under Creative Commons. Find me on Twitter, GitHub, old personal webpage, or shoot me an email.